The present official name of the barrio is Tejero. Its past and present name is Tejero. The barangay got its name when a Spanish priest in Jagna discovered that in a small and quiet barrio adjacent to Poblacion there was an abundant supply of clay soil termed “anapog” in the dialect. Then a crude tile kila was termed “tejera” in Spanish. From the Spanish term tejera they eventually changed it to “Tejero”. The barangay is divided into seven (7) sitios or district namely: the Riverside, Santa Cruz, Happy Valley, Tropical Heights, Greenhills, Ilihan Heights, and San Antonio Village. The residents dreamed to have a healthy body, free from sickness, to have abundant food to eat and to provide the youth quality education with dignity in order to live a comfortable life. To acquire a peaceful and harmonious community with abundant resources and better facilities that can be utilized by the people to enhance their physical, spiritual, emotional, intellectual aspect and for tem to be financially stable. The people envisioned having a clean and green environment that is free from illnesses and calamities caused by the people. Achieving this vision would make and help the people of Barangay Tejero. 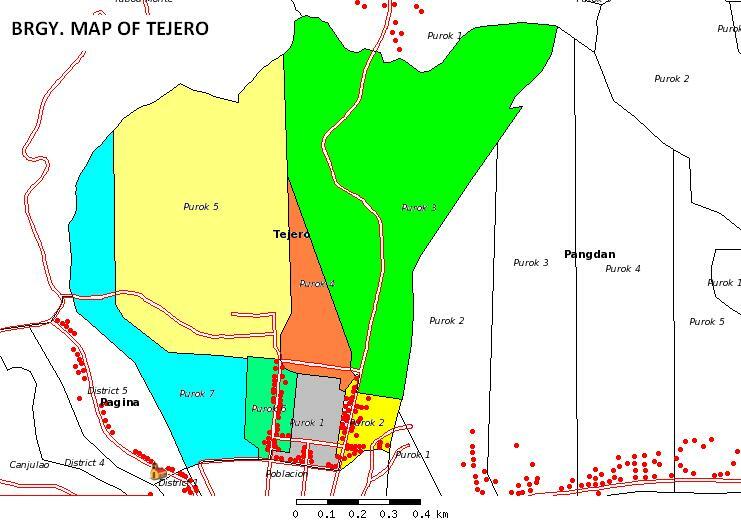 To achieve and to realize their vision, the mission of the people of Barangay Tejero is to support the Barangay Council in implementing the laws and ordinances, the plans and goals for the betterment and welfare of the people in general.